Autumn is over and it’s now time for hot teas with comfy meals under the blanket, watching a bunch of movies. Yes to more of that! 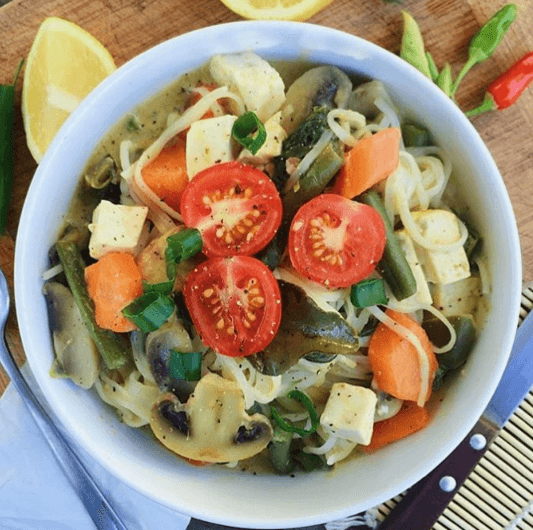 Vegan blogger Alysa Vongsykeo @alysaslifestyle jam packed our Hart & Soul Green Curry Kit with a bunch of veggies, but before we share her recipe creation, let’s get to know Alyssa a little bit. If you could be any animal in the world, what would it be? Why? Definitely a dolphin. I would love to experience life down under! Fill a pot with 150 ml of water, bring to the boil and empty the content of the Hart & Soul herbs sachet into the pot. Simmer for 2-3 minutes. Cut the vegetables into small pieces and place them in pot of boiling water, simmer until tender (or the way you like them). Add the tofu, Hart & Soul green curry paste and coconut cream into the pot. Gently stir. © 2019 Hart & Soul.